Girl Kuripot Girl Kuripot: Travel For Free! Go Anywhere Philippines! If you could go Anywhere Philippines, where would you go and what would you do? 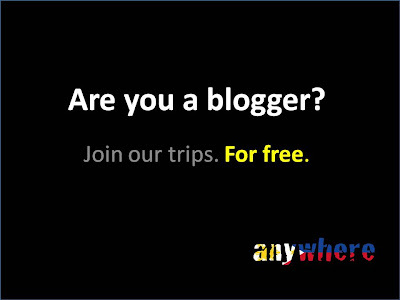 Here's a chance to win an exciting adventure - 4 Trips for 4 Bloggers 4 FREE from Anywhere Philippines! 1. If you are a blogger, all you have to do is to blog which Anywhere Philippines destination you would like to go to and why. Multiple entries are allowed so long as the destinations are different. Don't forget the links! 3. Email your details according to the format in their link. 4. Spread the word and be active in promoting the contest. You might just win a spot as Blogger of the Month (one for February, March, April and May)! Send your entries before February 28, March 31, April 30 and May 31, 2011!